Microsoft Dynamics CRM is one of the most popular platforms used by companies today. The number of benefits it provides to its users clearly outweighs the benefits offered by other CRMs in the same domain. Coming from the most profitable software company in the world, Microsoft CRM provides solutions to the problems which are faced while using any other platform. However, it is important to choose a reliable Microsoft Dynamics service provider. Outsource2india's Microsoft Dynamics services and Microsoft Dynamics consulting will address all the issues faced by clients and precisely cater to it. Our team of technology consultants will architect change and add value to support unique business requirements of our global clients. What Do Microsoft Dynamics Services Cover? What are the Microsoft Dynamics Services Offered by O2I? Our highly qualified consultants having in-depth industry knowledge and relevant experience will successfully implement Microsoft Dynamics solutions for you. We can help you implement Dynamics and roll it out to in your daily processes. At Outsource2india, we also work as a consulting partner, beyond software, and deliver a full-spectrum of Microsoft Dynamics consulting services. We can help businesses across various industry sectors and also help them implement Dynamics in different scenarios. We understand that business needs vary from one client to another. Hence we provide customized solutions that precisely cater to specific client requirements. Our customized application development services focus on niche and will be delivered on time and within the budget. Even after the CRM is successfully implemented and rolled out, our team provides continuous support for all your Microsoft Dynamics integration projects and promptly resolves any technical issues before it affects your business. 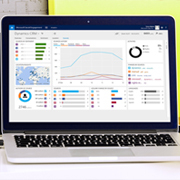 Why Should I Use Microsoft Dynamics CRM 4.0? How Can I Benefit by Outsourcing Microsoft Dynamics Services to O2I? We have an extensive knowledge about network configuration, active directory configuration, MS Office integration, SQL server integration, etc. Outsource2india, an outsourcing firm based in India, has been providing top-quality Dynamics CRM services and a plethora of other software development services to global clients for over 20 years now. We have been catering to the needs of clients from different backgrounds and domains. With a high implementation success rate, our services assure optimum service quality. We also provide Microsoft Windows SharePoint services. If you are looking for a reliable, accurate, efficient, and affordable Microsoft Dynamics ERP service provider in India, then you have come to the right place. Get in touch with us today.